The Golden Circle is a term or a description for one of the most popular tourist route in Iceland. The drive is based on three natural wonders not far from Reykjavík the capital of Iceland. Most of the time the tour starts and ends in Reykjavík and is driven in a day. The first stop is at Þingvellir which is a sacred place in Iceland where Almannagjá gorge and Öxarárfoss waterfall play a significant role. Þingvellir also has profound historical meaning in Iceland as it was the meeting place for Alþingi, the oldest parliament in history. Secondly, there is Geysir, the hot spring area where the geyser Strokkur erupts every ten or fifteen minutes. Thirdly and most importantly there is Gullfoss waterfall the most impressive waterfall in Iceland. A waterfall that is often mentioned on lists of top ten most fascinating waterfalls on the planet. The distance from Reykjavík through the town Mosfellsbær and Road Nr. 36 to Gullfoss via Þingvellir and Geysir is approximately 120 kilometers or 75 miles. How to drive the Golden Circle? Tourism in Iceland has exploded in recent years, and so has the Golden Circle drive. Sometimes during summer, the road is packed with busses, and rental cars as are the parking lots by the three natural wonders. 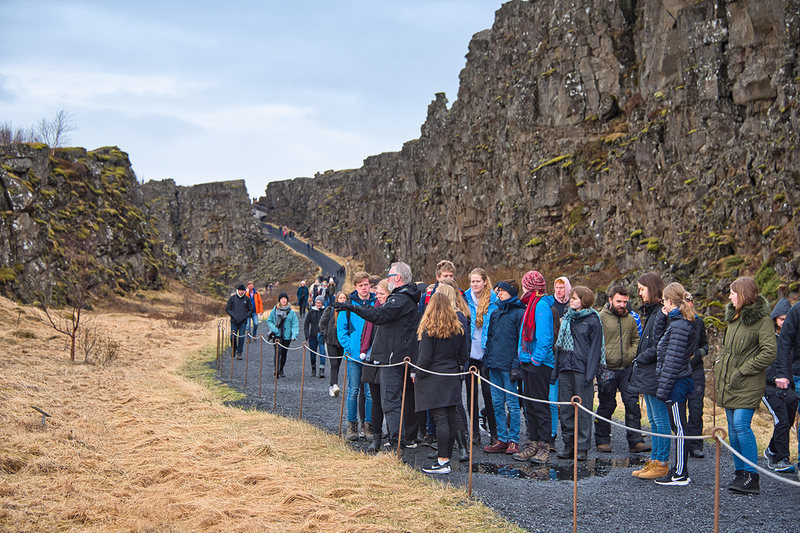 Usually, the buses depart from Reykjavík between eight and nine in the morning and arrive at the three natural wonders at a similar time. 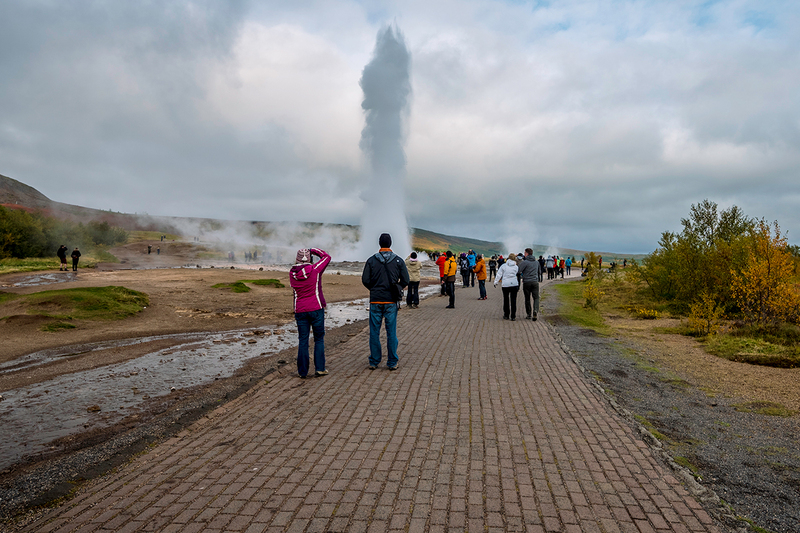 This is for many reasons a very convenient time to start and drive the tour as it fits well with lunchtime at Geysir or Gullfoss. If you are not intimidated by crowds you should start at the same time, otherwise start your tour early, around 6 am or 6:30 am. A stop at any of the three attractions takes about half an hour to 45 minutes. The road is an asphalt road and easy to drive in any car, small or large. It is a two-way lane so keep in mind that the road is a bit narrow but reasonably easy to drive. The exception is in winter when the weather is sometimes quite harsh, and the road from Reykjavík to Þingvellir is either closed or very slippery and challenging to drive. If you are traveling in winter, you should always check the weather and road conditions anyway. You should also consider the time of year and season when planning a trip to Iceland as there is a considerable difference between seasons. Here you can read about the best time or season to visit Iceland. Why drive the Golden Circle? All of the three attractions on the Golden Circle route are more than worthed to visit. Þingvellir is one of a handful of places in Iceland where you can see the North Atlantic rift system that stretches from the south pole up through the Atlantic ocean through the island Iceland. 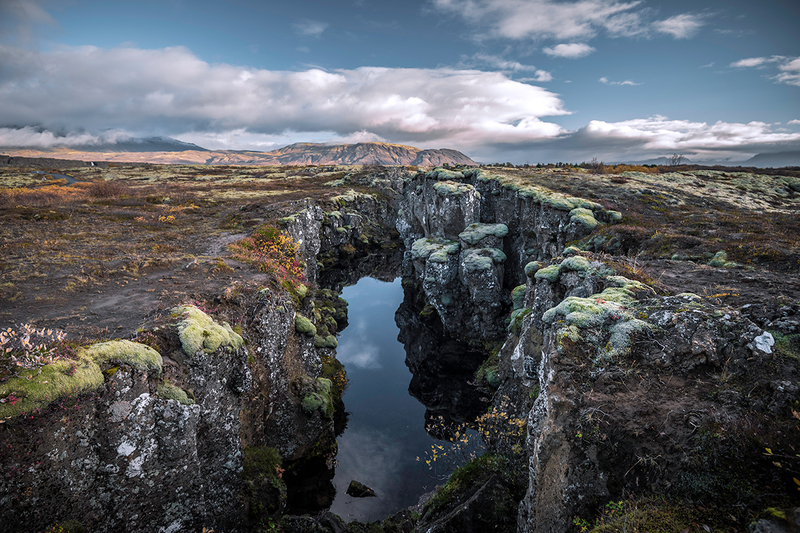 When you are in the gorge Almannagjá, you are between the European and American tectonic plates and at the spot where they drift apart. For those interested in history Þingvellir is also the most prominent place ins Iceland as it played an essential role in the judiciary and lawmaking process from the days of settlement throughout many centuries. It is also the place where Icelanders decided to abolish heathenism and take up christianity in the year 1000. Geysir is one of the best known hot springs in the world, and the English term geyser comes from the old hot spring Geysir, the big brother of Strokkur that still erupts today. Gullfoss, of course, is one of the most impressive waterfalls on the planet and is one of the natural wonders that are equally interesting to visit in summer and winter as well as in autumn and spring. So even though there are considerable differences between seasons in Iceland, these three natural wonders are all accessible and exciting all year round, which is probably one of the reasons the route is so hot. Is the Golden Circle a circle? 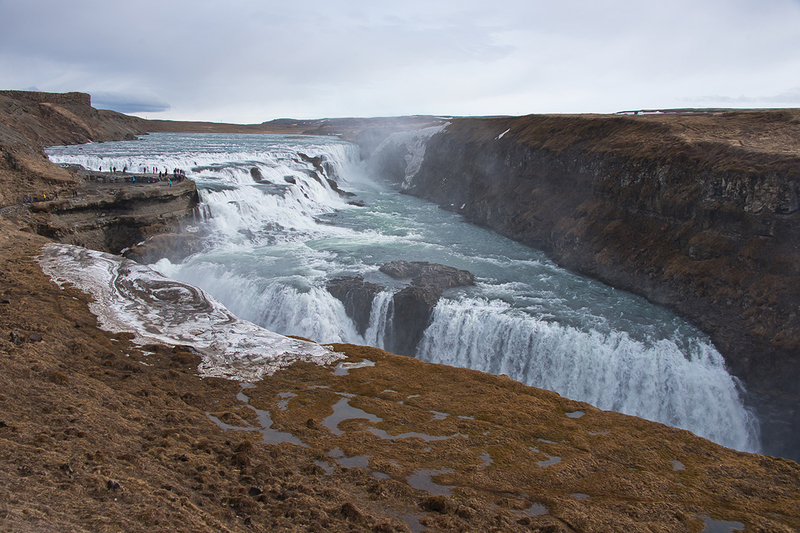 When you finish your drive at Gullfoss, you might wonder where you should go from there? What does it imply that it is a circle? If you started around eight in the morning, you are probably done viewing the three natural wonders and finished with lunch around one at noon. One option is to drive the one and a half hour drive back to Reykjavík, but then it's not a “circle” but a trip back and forth. For the ride back through a different route, you have some options. Here we are going to recommend the most interesting one for you to get the most out of your day. When you drive back from Gullfoss on Road 35 called Biskupstungnabraut, you take a left turn after 6 kilometers or approximately 4 miles on Road 30 called Skeiða- and Hrunamannavegur. After driving another 6 kilometers, you come to a bridge over the river Hvítá or White River. This is the same river that you saw falling in Gullfoss a few kilometers north. By the bridge is an interesting stop calls Brúárhlöð. It is worthed to stop at the parking lot on the east side and admire the how the river has formed the canyon at this spot for hundreds of thousands of years. After Brúárhlöð we recommend that you continue on Road 30 to the small hamlet of Flúðir. This is a 20 kilometers or approximately 13 miles drive to the south of Brúárhlöð. At Flúðir you have an opportunity to visit the old pool, Gamla laugin, and dip into a geothermal pool. It is also a good place to stop for snacks, refreshments, and restrooms. From Flúðir hamlet you continue south on Road 30 Skeiða- and Hrunamannavegur and drive 30 kilometers or 19 miles to Road 1 the Ring Road in Iceland. The drive is quite scenic, and if the day is bright, you will have a good view of both Hekla volcano and the famous Eyjafjallajökull volcano on the east side of the road. When you reach the intersection at Road 1, you take a left turn to the east and drive the 54 kilometers or 34 miles to the intersection of Road 1 to Road 249 Þórsmerkurvegur. 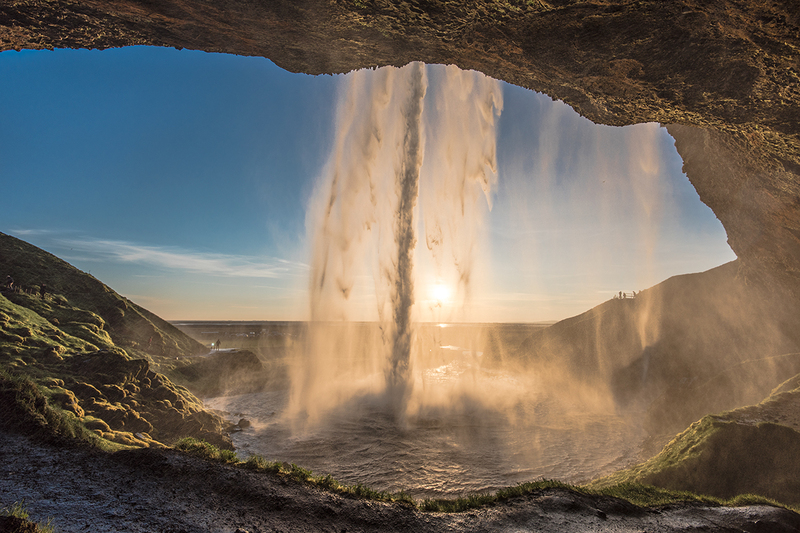 Here you drive less than one kilometer to reach the parking lot for Seljalandsfoss waterfall. The waterfall is one of the most visited natural wonders and attractions in Iceland and for a reason. It is not only a beautiful waterfall but also a waterfall that you can walk behind. It is indeed a spectacular experience and a relatively easy walk. In winter though you need to remember that the path behind the waterfall is quite slippery. If you are not in a great hurry to go back to Reykjavík, another spectacular waterfall Gljúfrabúi is within walking distance of Seljalandsfoss. It is a waterfall inside a gorge or a cave. Heading back after an eventful day you take the Ring Road Nr. 1 to the west to Reykjavík. You are most likely in the afternoon, and most people are a bit tired after all the stops and viewing of natural wonders and attractions. You should not underestimate the energy it takes for an average person. The drive back to Reykjavík is 130 kilometers or 80 miles. Along the way, you drive through four small towns and villages, Hvolsvöllur, Hella, Selfoss, and Hveragerði on the Ring Road Nr. 1. All of the towns have restaurants and convenient stores so you can easily stop for snacks and restrooms along the way. If you drive straight back to Reykavík you will have the opportunity to dine at some of the spectacular restaurants that you find in Reykavík city center and hit the sack for a convenient good night sleep at some of the many great hotels in the city. The whole drive as we recommend here is 370 kilometers or 230 miles. In comparison, the drive back and forth from Reykjavík to Gullfoss waterfall is 240 kilometers or 150 miles. The whole trip shouldn't take more than 9 to 10 hours even at a slow pace. There are plenty of places and opportunities along the way for restroom stops and food, and if the skies are reasonably clear, it is also a beautiful scenic drive. The Golden Circle drive is a great way to view and experience some of the most interesting natural wonders Iceland can offer and is also available and relatively easy to drive all year round. 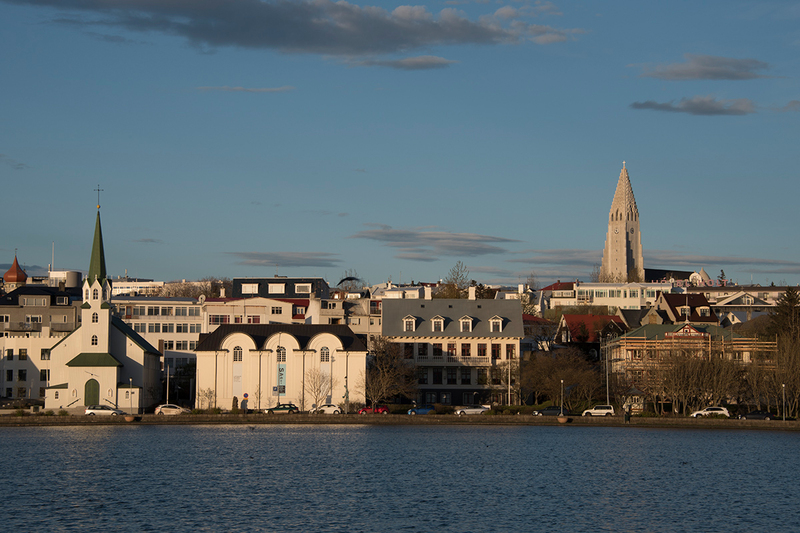 It is a great option to spend a day when visiting Iceland and staying in Ryekjavík for a few days or a stopover. 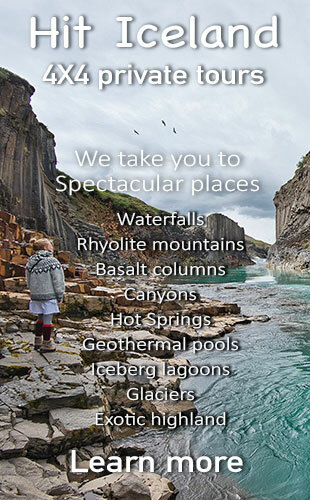 In the summer there is also the option of visiting the highland and join us on our spectacular Hit Iceland Landmannalaugar highland and Golden Circle tour.